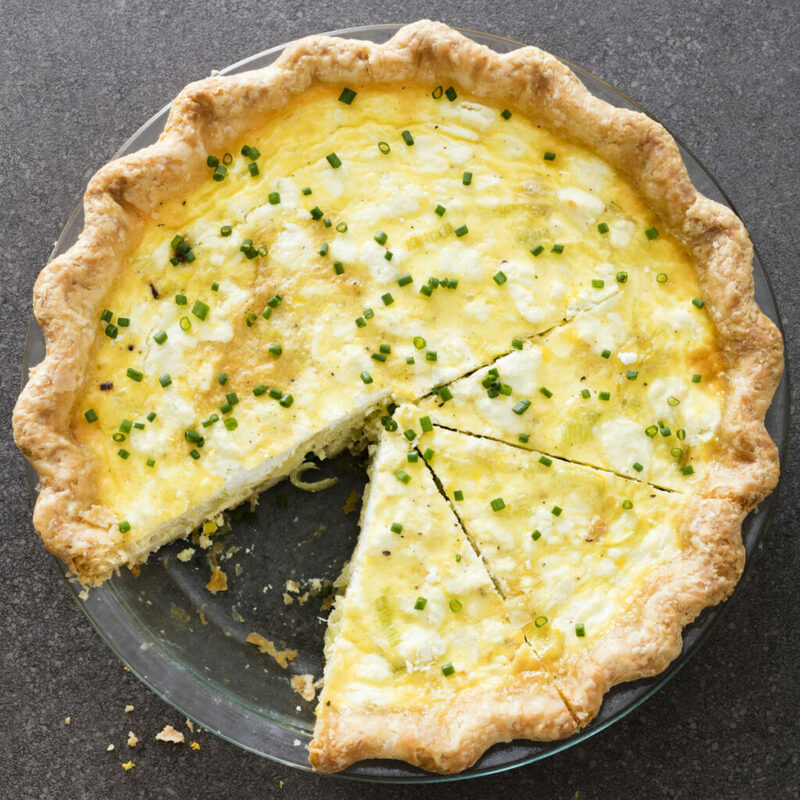 This quiche’s velvety custard makes it perfect for an elegant affair or a laid-back brunch. Store-bought pie dough, partially baked and still warm, can be used in place of the homemade crust. FOR THE CRUST: Whisk ice water and sour cream together in bowl. Process flour, sugar, and salt in food processor until combined, about 3 seconds. Scatter frozen butter over top and pulse mixture until butter is size of large peas, about 10 pulses. Pour half of sour cream mixture over flour mixture and pulse until incorporated, about 3 pulses. Repeat with remaining sour cream mixture. Pinch dough with your fingers; if dough feels dry and does not hold together, sprinkle 1 to 2 tablespoons more ice water over mixture and pulse until dough forms large clumps and no dry flour remains, 3 to 5 pulses. Turn dough onto sheet of plastic wrap and flatten into 4 inch disk. Wrap tightly and refrigerate for at least 1 hour or up to 2 days. Before rolling dough out, let it sit on counter to soften slightly, about 10 minutes. Roll dough between 2 large sheets parchment paper to 12-inch circle. (If dough is soft or sticky, refrigerate until firm.) Remove parchment on top of dough round and flip into 9 inch pie plate; peel off second sheet of parchment. Lift dough and press into pie plate. Cover loosely with plastic and refrigerate until firm, about 30 minutes. Trim all but 1/2 inch of dough overhanging edge of pie plate. Tuck dough underneath to form tidy, even edge that sits on lip of pie plate. Crimp dough evenly around edge of pie plate using your fingers. Wrap dough-lined pie plate loosely in plastic and refrigerate until firm, about 15 minutes. Adjust oven rack to middle position and heat oven to 400 F. Line chilled crust with double layer of aluminum foil, covering edges to prevent burning, and fill with pie weights or pennies. Bake until dough looks dry and is pale in color, 25 to 30 minutes. Transfer to rimmed baking sheet and remove weights and foil. FOR THE FILLING: Reduce oven to 350 F. Melt butter in 10-inch nonstick skillet over medium-high heat. Add leeks and 1/2 teaspoon salt and cook until softened, about 6 minutes; transfer to bowl. Whisk eggs, half-and-half, 1/4 teaspoon salt, and pepper together in large bowl. Stir in leeks and goat cheese. Place pie shell in oven and carefully pour egg mixture into warm shell until it reaches 1/2 inch from top of crust (you may have extra egg mixture).